The Mark Casse-trained runners Kaigun and Lockout ran one-two in Sunday’s Grade 2, $224,800 Play the King Stakes, an important prep for the next month’s Grade 1 Woodbine Mile. 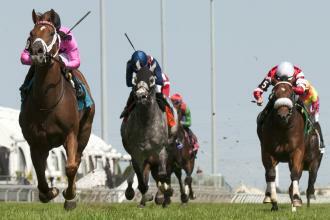 In an important prep for the Woodbine Mile, Kaigun (left) finished on top Sunday in the Play the King Stakes at Woodbine. The longshots Global Power and Sharp Sensation hooked up during quick fractions of 21.98 seconds and 44.59 in the seven-furlong turf sprint, while Something Extra stalked them in third. Kaigan and Lockout saved ground on the turn while far back before they both mounted a wide rally in the stretch, and Kaigun prevailed by three-quarters of a length, in 1:20.71 over the firm ground. Dimension overcame a slow start to grab third over a weakening Something Extra. Winning Prize, the 2-1 favorite from California, wound up sixth in the 10-horse field. Kaigun ($9.80) got a confident ride from Patrick Husbands. Kaigun earned $144,000 in his first stakes victory for the partnership of Gary Barber, Quintessential Racing Florida LLC, and Horse’n Around Racing Stable.